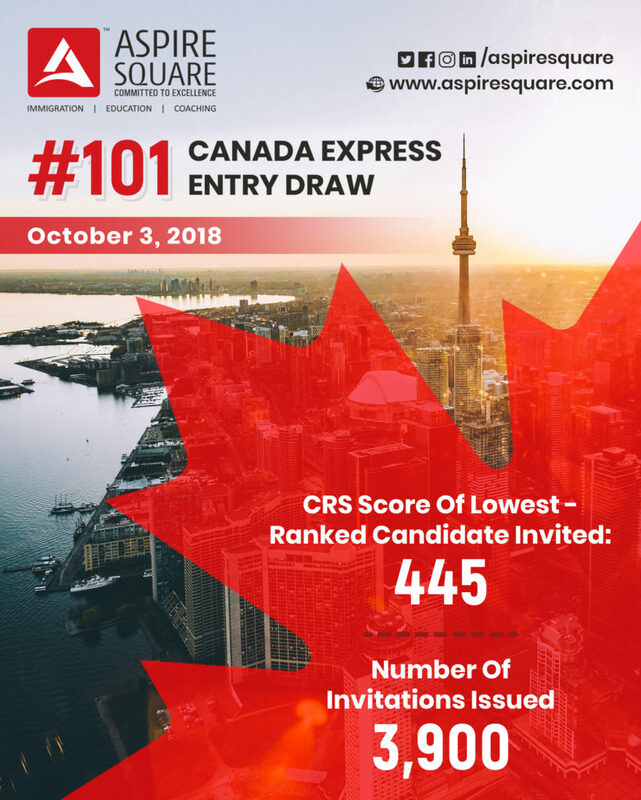 With the latest Express Entry draw 3900 lucky candidates got an Invitation to Apply with CRS cut-off threshold at 445 points. These numbers are revealed joint highest invitations issued in a single draw so far in this year of Invitation round. In compare to previous draw 400 more candidate received the ITA and the CRS cut-off also slightly increased by 4 points stood at 445 in compare to 441. With 445 CRS points a tie breaks was applied and candidate whose profile in pool before 2nd October 2018 at 4:02:11 got priority. With the current draw the total invitation issued to year reached at 66,400. As a Canada Immigration Specialist in Gujarat, Aspire Square would like to help you out if your profile is in the pool but are yet to receive an Invitation to apply. If you want to Migrate to Canada with the express Entry option contact us to get your free and accurate eligibility assessment. Email – inquiry@aspiresquare.com | M – 0091 88 66 88 07 07.